Chalk's Industrial Equipment provides a wide range of quality used forklifts for sale, rent (daily, weekly or monthly) or lease for the Maryland, Delaware, Virginia and DC areas since 1989. We also provide parts and repair service on all propane, electric, gasoline, diesel, and all brands of forklifts. Looking to sell a forklift? We gladly buy quality used forklifts. We currently stock over 100 forklifts and our inventory constantly changes. 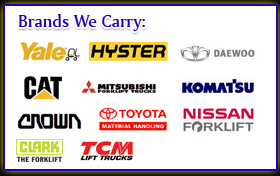 Our lift trucks vary in capacity from 2,000 pounds to 30,000 pounds. We stand behind all the forklifts that we sell with a 30 day guarantee. We offer financing to those who qualify tailored to fit your needs and budget. Chalk's Industrial Equipment has proudly been serving the industrial community for over 20 years. Our experience has enabled us to better serve our customers, and offer the best prices for any budget. Whether you’re looking for a quality used forklift, rental, or need to repair your own machine. We can provide these services at a price within your budget range. Our goal at Chalk’s is to continually earn your satisfaction through courteous, prompt and reliable Service. Check out our In-Stock Inventory page, come for a visit, or give us a call at 410-686- 6800.